The Makita 18V X2 LXT Plunge Cut Saw is a must-have for convenience and performance. I am old enough to have been around when the first battery-powered tools came on the market. To classify the early ones as tools may be stretching the imagination a bit, but I digress. The cordless industry has come a lonnnnnnng way since then and I now have quite a few cordless tools in my arsenal. At the moment, I’m considering if the Makita cordless track saw has a place in my shop. Now in my experience, cordless convenience has always come with a price. Lack of power, short run time, batteries going dead before the others charge. You get the idea. So you can’t blame me for being a little skeptical when asked to review Makita’s 18V X2 LXT Plunge Cut Saw. I reviewed the Makita SP6000J track saw a few months ago and am fairly impressed with the quality of the build and the straightforward design. Since the Makita XPS01 is built on the same foundation, I’m going to focus in on how the two compare. The Makita XPS01 comes in two varieties. You can get it as a bare tool or kitted with a dual charger and 5.0 Ah batteries. For testing, I got my hands on the kit along with Makita’s 55″ track – the same one you use with their corded track saw. At first glance, the Makita cordless track saw seems a clone of the corded version but upon a closer look has a few unique differences. The XPS01 has a slightly lower profile and an expanded lower handle that appears to be a heat sink for the motor. The two large batteries are also prominent atop and below the motor housing. Both the saws have the same 48° bevel capacity and 55 mm depth of cut. That’s 2.165″ for us old guys. Both models have a unique scoring feature that all but eliminates veneer chips as well as variable speed controls that allow you to match the blade speed to the material you are cutting. That’s a great help when cutting laminates that will melt with too high a blade speed. The bases are almost identical in form and function. Rail lock slides for making bevel cuts and friction control are in identical left base positions, and the adjustable dust ports are the same. Both have on-board wrenches for blade changes, soft start motors, and electronic speed control. I have grown accustomed to using the corded SP6000J to break down ¾” cabinet plywood instead of the table saw. The simplicity of setup and the ability to make tapered bevel cuts with ease make this tool a standout. So I put the cordless model through the same routine. Something that stands out to me immediately is that the ergonomics of are a little different with the cordless saw. The weight of the two 18V batteries and the slightly tweaked handle design gives this beast a front heavy disposition. Given that this unit is designed to glide along a rigid track, the weight distribution works to its advantage as the saw seats and maintains its position on the track very well. Makita has fantastic stock saw blades. That’s important for a tool like this. It allows you to cut well on fine veneer plywoods with virtually no tear out. With some saws, you need to pick up a quality third-party blade to go along with your purchase, but that’s not the case for Makita. The power delivered by the 36V brushless motor is more than adequate for my carpentry tasks. Having enough power to match the corded track saw isn’t a huge surprise. The SP6000J does everything I ask of it on a 12-amp motor. Getting 36V of lithium-ion power to give me the same performance isn’t too tall an order. What that means is that there’s plenty of stored energy in those battery packs to give you impressive runtime along with the power. A Makita brushless motor helps as well. The Makita cordless track saw powered through more than fifty 48” cuts with plenty more in store. Pro Tip: Although the Makita XPS01 fits any Makita track and others such as Festool, be aware that different tracks will impact the chip guard differently. 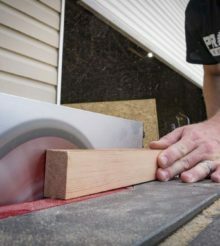 If you use the guard for alignment, as we all do, be sure to calibrate the cut line or use each track with its own saw. Otherwise, you’ll get to do you cuts over. On its own, the bare tool is $349 or $499 for the kit. The caveat here is that you have to purchase the track separate – something that I consider a must-have to take advantage of the design. That’s another $75 if you don’t have another one at your disposal. On the corded side, you can grab the SP6000J with the rail for $409. If you already have the batteries you need, that’s a $15 premium to go cordless – not bad at all. If you need to purchase the kit, your premium goes up to $165 over the corded kit, which might make you think a little bit. The good thing is that you’re not trading off less power and short runtime if you go cordless. There’s enough of both for the Makita cordless track saw to be your primary track saw and the batteries recharge fast enough to keep up with demanding days. Job site carpenters will see the biggest benefit, but there’s a lot to be said for the convenience cordless brings to the shop as well. Makita continues to impress me with their cordless technology. The Makita 18V X2 LXT Plunge Cut Saw is a must-have for convenience and performance. While corded equipment will always have a place in the field, the cordless brigade from Makita is earning its stripes. Now if Tesla would hurry up and partner with Ford on a battery-powered F-150, life would be fine. One other quick note – Makita also has the SPT02 – an AWS-enabled version of the same saw. A professionally trained Journeyman carpenter, Richard co-owns a stair and trim installation company with his son Matthew. When not wearing one of the many hats of a business owner, he enjoys spending time with his 7 grandchildren and traveling with his wife Lori.